Welcome aboard the world of the superyachts, where billionaires soak up the sun while their staff tend to their every whim. Marie Claire speaks to the Australian Yacht Crew who toll away at sea – and party hard once they reach land. Lauren Valkoren is enjoying the weather. She’s barefoot; her legs are crossed. It’s early December, which in the Caribbean means it’s breezy and warm. A gleaming white ship croaks against the dock behind her. It’s the final day of the Antigua Charter Yacht Show, so she’s finally free to breathe a little. Maybe tonight she’ll even get to slip into the spa. Adelaide-born Valkoren, 30, spends most of the year aboard the 55-metre-long, Turkish-built superyacht Sequel P, flitting between the Mediterranean and the Caribbean. But she’s not the owner, or even a guest. Instead, she’s one of thousands of Australians staffing these floating palaces. As chief steward, she’s spent the past six days serving carousels of truffled foie gras lollipops to yacht brokers, arranging orchids, and cleaning shower drains, a chore she considers to be a small price to pay for living under the equatorial sun. Besides, it’s nothing compared to the tasks demanded by some other superyacht owners: Pizza Hut deliveries from the US to France, multiple glasses of water – all at different temperatures – served at every meal, or arranging to have a dress flown from the Caribbean to New York to be dry-cleaned. As any deckhand will tell you, the world of a superyacht crew member is equal parts glamour and grit. It’s a job that offers access to some of the world’s most beautiful locales and its richest and most powerful citizens – as well as a window to the darker side of the excess and extravagance that comes with a superyacht-sized income. The nautical high life is nothing new. The Caribbean has long been home to yachts of the rich and famous, but never before have their vessels been so luxe. 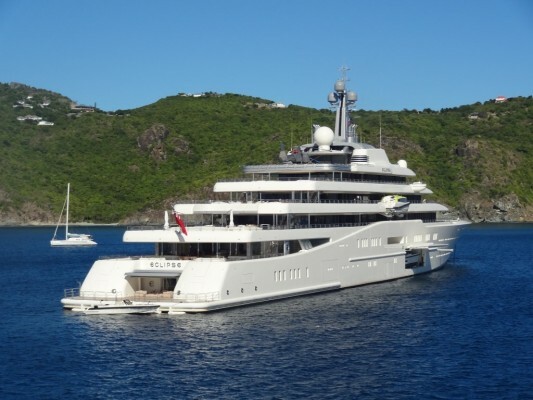 In the past seven years, the number of superyachts – which by definition must exceed 24 metres and be professionally manned – has increased by 43 per cent. The starting price for these superlative ships is $200 million – a staggering cost to some, but priceless for a certain echelon of sun-loving billionaires seeking privacy from the paparazzi. The vessels, which look like spaceships and function like luxury hotels, are outfitted with heated marble floors, glass elevators, infinity pools and snakeskin walls. Their fresh produce is delivered by helicopter, their movies are projected onto sails, their flowers come from Monaco. And every December they all head for one place: St Barts. From Christmas to New Year, this tiny Caribbean island, which is studded with red roofs and dissected by anarchically narrow roads, is where the world’s richest VIPs come to do nothing. Here, delis playing calypso music stand alongside luxury boutiques – Chanel, Chopard, Hermès – making the French territory feel like a kind of beachfront Champs Elysées. 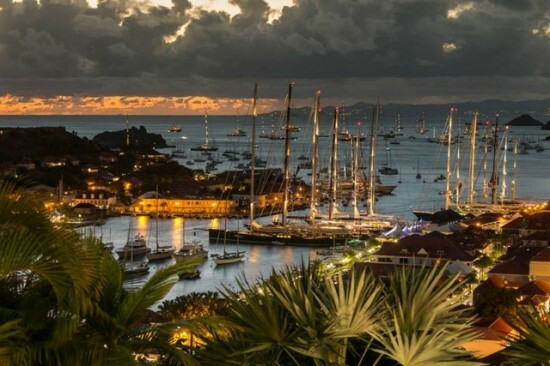 St Barts, a Caribbean version of the Côte d’Azur, is frequented by the likes of Beyoncé, Jay Z, Diddy, Gisele Bündchen and Catherine Zeta-Jones, not to mention Bill Gates, Giorgio Armani, and numerous anonymous Russian oligarchs. But it’s not just the filthy rich who are soaking up the sun. It’s estimated that 60 per cent of the thousands of deckhands, stewards and chefs that staff these storied vessels are Australians or New Zealanders. These mostly 20- and 30-somethings have made a career out of travelling to some of the world’s most isolated and exclusive destinations. Most finish their stints with Facebook photo albums bursting with images of gin-clear seas, pristine beaches and whitewashed villages. In return, they’re expected to prepare personalised meals, make cashmere-coated beds, iron designer clothes, and never say no. That’s their job description, at least. They also get plates of fettuccine thrown in their face, fetch individual peaches by helicopter, clean toilet seats with cotton buds, and are used as human ottomans. During a charter, a yachtie might work 18-hour days for four months without a day of leave. “You really need a sense of humour,” remarks Deborah Brand, who has worked as a steward on yachts for more than a decade. It’s just after sunset on a December evening and the 38-year-old Australian is sipping an espresso martini outside Skullduggery Cafe, an Antiguan bar popular with those from Down Under. Brand brushes her chestnut hair out of her eyes and adjusts the white strap of her tank top, which looks glow-in-the-dark against her bisque-coloured shoulder. “You’ve got to be able to laugh,” she continues. “These people request the most ridiculous things.” Some ridiculous things include Big Macs helicoptered to the middle of the Mediterranean, and a winter-themed party (complete with snow machine) in the middle of July because some Italian guests were “bored with summer”. Brand remembers one Greek guest who requested that all her outfits be cut in half with scissors after they were worn once. Another guest, a sheikh, demanded that strands of seaweed be removed from around the boat with nets so he could swim, debris-free. That yachties spend most of their time toiling unseen doesn’t mean they’re allowed to look too invisible. It’s an image-driven industry, where a surplus of weight on a woman and a deficit of hair on a man are professional liabilities: female stewards are often fired for going up a dress size and captains are dismissed for going bald. That said, it’s not uncommon for owners’ jealous wives to prohibit blondes from working on their boats. It’s honour code not to ask after the guests on a yacht – only newbies are dumb enough to inquire. Shipowners and charter guests alike are paying top dollar for anonymity and a rescinded tip wouldn’t be worth it for a little late-night gossip. There are rumours, though: the yacht that once belonged to Johnny Depp was supposedly upholstered in red velvet; the Eclipse, Russian oligarch Roman Abramovich’s yacht (the second largest in the world after that owned by Sheikh Khalifa bin Zayed al-Nahyan, president of the United Arab Emirates), has two helipads, a disco hall, a mini submarine, a German-built missile defence system, and an anti-paparazzi shield that somehow involves lasers. Among the other industry-specific rules are “don’t screw the crew” and “if you can speak Russian, don’t let anybody know it”. Number one is in place to prevent romantic distractions; number two ensures that oligarchs can conduct business privately. Not that the superyacht owners themselves adhere to many rules. Brand has seen her fair share of religious laws suspended at sea – bacon sandwiches requested by Muslim guests at 4am (after all pork has been removed from the ship), scotch sipped from teacups lest any maritime neighbours catch a glimpse, and gambling on deck while a harem of women dances on command. It’s not unheard of for a Muslim guest to wake up hung-over and ask the captain which way Mecca is, only to be pointed in a random direction. After months of labour camp-calibre work, reaching shore can be cathartic – and boozy – for yacht crew. Free at last and flush with cash, chefs, stewards and deckhands will descend on beachfront bars with an urgency that is perhaps even more intoxicating than the liquor they’ll consume. Poles get straddled and laps are danced on. It’s not unheard of to be showered (literally) in $60,000 worth of champagne. “Nobody can drink like a yachtie,” says Olivia Bunny, 29, who recalls one rowdy weekend spent with crew members in Italy, when fire extinguishers were ripped from hotel walls and heavy furniture was thrown off balconies. It’s a little after 10pm at the Soggy Dollar Bar, one of the most beloved bars on the Caribbean island of St Maarten, and the yachties are in the early stages of what’s gearing up to be a typically large night. The floors are made of unsanded wood, surfboards hang from the ceiling, and there’s a not insignificant amount of Jägermeister on tap. 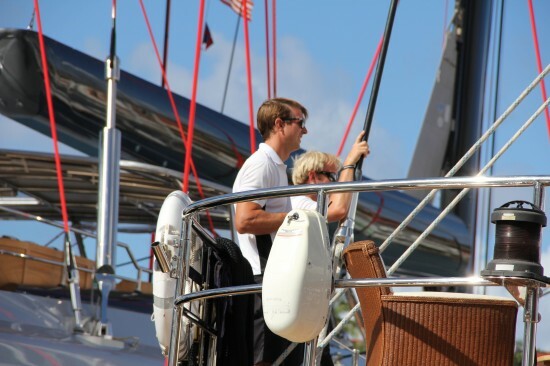 Dylan Reece, a charming British yacht chef, lays out the basic economics of yachting. “Size does matter,” he laughs over the blood-sloshing techno. A year of maintenance costs 10–20 per cent of the boat’s price, and for every metre you can expect to pay about $1 million in maintenance fees. He says a premier yacht can charter for up to $750,000 a week, a fee that doesn’t include fuel, food, or service. Needless to say, crew and guests don’t often find themselves socialising in the same places. At 30, Katie Clunies-Ross might be among the luckiest of yachties. Originally from the Cocos (Keeling) Islands, Clunies-Ross met her boyfriend at university in Perth, and with the exception of a few short seasons early on they’ve been able to work together for the past eight years – he as a first mate, she as a chief steward. The boat they’re now on, the Sealyon, was built in Italy in 2009 and measures 62 metres. Its walls are quilted leather, and a Swarovski crystal chandelier and matching self-playing piano adorn the main lounge. A glass floor allows sunlight from above deck to the very bottom of the hull (sensors will fog it up to preserve guests’ privacy). The walk-in wardrobe in the master suite is lined with eel skin and custom fitted with rods especially measured to hang the owner’s wife’s extensive collection of Birkin bags (average price: $45,000). All the boat’s appliances retract into polished wood: cabinetry, hairdryers, printers, scanners all disappear at the push of a button. A motorised outdoor table expands and contracts in size, and can even be transformed into a performing stage. Nearby, a round section of the upper deck revolves slowly to ensure guests are evenly and deeply tanned. Clunies-Ross calls it “the roasting machine”. Not only does she enjoy the rare luxury of a logistically uncomplicated romantic relationship, but Clunies-Ross’s career has been free of psychological assault. The horror stories in this industry are legion – the African prince flying 16-year-old Siberian girls to the Caribbean and doing cocaine until dawn seems representative – but so is the camaraderie. “You live in the rich man’s bubble, which is something you can’t do as a backpacker,” observes Joy Weston, owner, founder and operator of Crew Pacific, a Cairns-based training and recruitment agency. “The friends you make and the fun you have along the way are out of this world.” But enjoying the benefits granted by one’s proximity to extreme wealth doesn’t mean a yachtie can’t be critical of it.